Available in paperback and e-book from Amazon.com, Deseret Book and Greg Kofford Books. 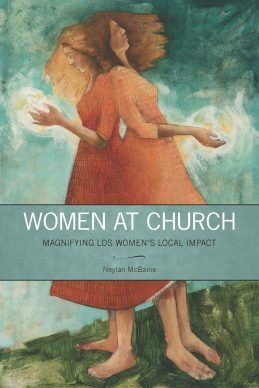 Women at Church: Magnifying LDS Women’s Local Impact by Neylan McBaine is a practical and faithful guide to improving the way men and women work together at church. Looking at current administrative and cultural practices, the author explains why some women struggle with the gendered divisions of labor. She then examines ample real-life examples that are currently happening in local settings around the country that expand and reimagine gendered practices. Readers will understand how to evaluate possible pain points in current practices and propose solutions that continue to uphold all mandated church policies. Readers will be equipped with the tools they need to have respectful, empathetic and productive conversations about gendered practices in Church administration and culture. Mormon Women Project founder Neylan McBaine draws on years of study and conversations as well as hundreds of interviews to offer real-world ideas that are happening now in wards and stakes. All royalties from the book go to supporting the Mormon Women Project. For additional reviews and video discussions about Women at Church, visit Greg Kofford Books. Neylan is available for appearances such as ward or stake events, Relief Society events, book clubs, discussion groups. Email [email protected] to get in touch.